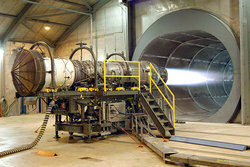 A Pratt and Whitney turbofan engine for the F-15 Eagle is tested at Robins Air Force Base, Georgia, USA. The tunnel behind the engine muffles noise and allows exhaust to escape. The mesh cover at the front of the engine (left of photo) prevents debris - or people - from being pulled into the engine by the huge volume of air rushing into the inlet. A jet engine is a type of air-breathing internal combustion engine often used on aircraft. The principle of all jet engines is essentially the same; they accelerate a mass (air and combustion products) in one direction and, from Newton's third law of motion, the engine experiences thrust in the opposite direction. The engine draws air in at the front and compresses it. The air is combined with fuel, typically ignited by flame in the eddy of a flame holder, and burned as an atomized mixture. The combustion greatly increases the energy of the gases which are then exhausted out of the rear of the engine. The process is similar to a four-stroke cycle, with induction, compression, ignition and exhaust taking place continuously. The engine generates thrust because of the acceleration of the air through it—the equal and opposite force this acceleration produces is thrust. Jet engines take a relatively small mass of air and accelerate it by a large amount, whereas a propeller takes a large mass of air and accelerates it by a small amount. The high-speed exhaust of a jet engine makes it efficient at high speeds (especially supersonic speeds) and high altitudes. On slower aircraft and those required to fly short stages, a gas turbine-powered propeller engine, commonly known as a turboprop, is more common and much more efficient. Very small aircraft generally use conventional piston engines to drive a propeller but small turboprops are getting smaller as engineering technology improves. The combustion efficiency of any given jet engine, like any internal combustion engine, is strongly influenced by the ratio of the compressed air's volume to the exhaust volume. In a turbine engine the compression of the air and the shape of the ducts passing into the ignition chamber prevents backflow from it and thus makes possible the continuous burning and propulsion process. Modern turbojet engines are modular in concept and design. The central power-producing core, common to all jet engines, is called the gas generator (described above). To it are attached peripheral modules such as propeller reduction gearsets (turboprop/turboshaft), bypass fans, and afterburners. The kind of peripheral fitted is dependent on the aircraft design application. Since the dawn of powered flight, the reciprocating piston engine in its different forms (rotary and static radial, aircooled and liquid-cooled inline) had been the only type of powerplant available to aircraft designers. This was understandable so long as low aircraft performance parameters were considered acceptable, and indeed inevitable. However, by approximately the late 1930s, engineers were beginning to realize that conceptually the piston engine was self-limiting in terms of the maximum performance which could be obtained from it; the limit was essentially one of propeller efficiency, which seemed to peak as blade tips approached supersonic radial velocity. If engine, and thus aircraft, performance was ever to increase beyond such a barrier, a way would have to be found to radically improve the design of the piston engine, or a wholly new type of powerplant would have to be conceived. The latter would prove to be the case. The gas turbine (turbojet, or simply jet) engine, as subsequently developed, would become almost as revolutionary to aviation as the Wright brothers' first flight. The gas turbine was not an idea developed in the 1930s, the patent for a stationary turbine was granted to John Barber in England in 1791. The earliest attempts at jet engines were hybrid designs in which an external power source supplied the compression. In this system (called a thermojet by Secondo Campini) the air is first compressed by a fan driven by a conventional piston engine, then it is mixed with fuel and burned for jet thrust. Three known examples of this type of design were the Henri Coanda's Coanda-1910 aircraft, the much later Campini Caproni CC.2, and the Japanese Tsu-11 engine intended to power Ohka kamikaze planes towards the end of World War II. None were entirely successful and the CC.2 ended up being slower than the same design with a traditional engine and propeller combination. The key to the useful jet engine was the gas turbine, used to extract energy to drive the compressor from the engine itself. The first gas turbine to successfully run self-sustaining was built in 1903 by Norwegian engineer Aegidius Elling. The first patents for jet propulsion were issued in 1917. Limitations in design and practical engineering and metallurgy prevented such engines reaching manufacture. The main problems were safety, reliability, weight and, especially, sustained operation. On January 16, 1930 in England Frank Whittle submitted patents for his own design for a full-scale aircraft engine (granted in 1932). In 1935 Hans von Ohain started work on a similar design in Germany, seemingly unaware of Whittle's work. Ohain approached Ernst Heinkel, one of the larger aircraft industrialists of the day, who immediately saw the promise of the design. Heinkel had recently purchased the Hirth engine company, and Ohain and his master machinist Max Hahn were set up there as a new division of the Hirth company. They had their first HeS 1 engine running by September 1937. Unlike Whittle's design, Ohain used hydrogen as fuel, which he credits for the early success. Their subsequent designs culminated in the gasoline fuelled HeS 3 of 1,100 lbf (5 kN), which was fitted to Heinkel's simple and compact He 178 airframe and flown by Erich Warsitz in the early morning of August 27, 1939 from Marienehe aerodrome, an impressively short time for development. The He 178 was the world's first jetplane. In England, Whittle had significant problems in finding funding for research, and the Air Ministry largely ignored it while they concentrated on more pressing issues. Using private funds he was able to get a test engine running in 1937, but this was very large and unsuitable for use in an aircraft. By 1939 work had progressed to the point where the engine was starting to look useful, and Whittle's Power Jets Ltd. started receiving Air Ministry money. In 1941 a flyable version of the engine called the W.1, capable of 1000 lbf (4 kN) of thrust, was fitted to the Gloster E28/39 airframe, and flew in May 1941. One problem with both of these early designs, which are called centrifugal-flow engines, was that the compressor works by "throwing" (accelerating) air outward from the central intake to the outer periphery of the engine where the air is then compressed by a divergent duct setup—converting velocity into pressure. The advantage was that such compressor designs were well understood in centrifugal superchargers but this leads to a very large cross section for the engine at rotational speeds that were usable at the time. A disadvantage was that the air flow had to be "bent" to flow rearwards through the combustion section and to the turbine and tailpipe. With improvements to bearings the shaft speed of the engine would increase and the diameter of the centrifugal compressor would reduce greatly. The shortness of this engine is an advantage. The strength of this type of compressor is an advantage over the later axial flow compressors that are still liable to foreign object damage (FOD in aviation parlance). Austrian Anselm Franz of Junkers' engine division (Junkers Motoren or Jumo) addressed this problem with the introduction of the axial-flow compressor. Essentially, this is a turbine in reverse. Air coming in the front of the engine is blown to the rear of the engine by a fan stage (convergent ducts), where it is crushed against a set of non-rotating blades called stators (divergent ducts). The process is nowhere near as powerful as the centrifugal compressor, so a number of these pairs of fans and stators are placed in series to get the needed compression. Even with all the added complexity, the resulting engine is much smaller in diameter. Jumo was assigned the next engine number, 4, and the result was the Jumo 004 engine. After many teething troubles, mass production of this engine started in 1944 as a powerplant for the world's first jet-fighter aircraft, the Messerschmitt Me 262. Because Hitler wanted a new bomber the Me 262 came too late to decisively impact Germany's position in World War II but it will be remembered as the first use of jet engines in service. After the end of the war the German Me 262 aircraft were extensively studied by the victorious allies and contributed to work on early Soviet and US jet fighters. British engines also were licensed widely in the US. Their most famous design, the Nene would also power the USSR's jet aircraft after a technology exchange. American designs wouldn't come fully into their own until the 1960s. Turbofan power tapped off exhaust used to drive bypass fan quieter due to greater mass flow and lower total exhaust speed, more efficient for a useful range of subsonic airspeeds for same reason greater complexity (multiple shafts), large diameter engine, need to contain heavy blades. More subject to FOD and ice damage. For subsonic aircraft, the air intake to a jet engine presents no special difficulties, and consists essentially of an opening which is designed to minimise drag, as with any other aircraft component. 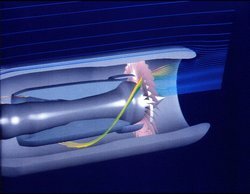 However, the air reaching the compressor of a normal (not scramjet) jet engine must be travelling below the speed of sound, even for supersonic craft. The compressor is the series of fans that are spaced very closely together. Each fan compresses the air a little more. Energy is derived from the exhaust fan (see below), passed along the shaft. This carries power from the exhaust fan to the compressor, and runs most of the length of the engine. There may be as many as three concentric shafts, rotating at independent speeds, with as many sets of exhaust fans and compressors. Other services, like a bleed of cool air, may also run down the shaft. These are combustion chambers where fuel is continuously burned in the compressed air. These gather energy from the hot expanding air rushing out of the engine. This energy is used to drive the compressor through the shaft, or bypass fans, or props, or even (for a gas turbine-powered helicopter) converted entirely to rotational energy for use elsewhere. (mainly military) Produces extra thrust by burning extra fuel, usually inefficiently, at the exhaust. Air, once cooled and expanded, is vented out the back of the engine. Exhausts are designed to maximize thrust, since venting hot air does not provide nearly as much thrust as venting fast-moving cool air. The standard aerodynamic reference frame is attached to the aeroplane. Air must travel through the engine at subsonic speeds, to sustain operation of flow mechanics at the blades of the compressors and turbines. The supersonic nozzle is needed to convert the pressure and heat to velocity, and consequently momentum of the expelled air. A de Laval nozzle tapers down to a neck, accelerating the gas up to sonic speed, and then the nozzle opens out again. The hot gas thus expands and cools whilst pressing on the inside of the nozzle at a rearward facing angle. This accelerates the air even further; forming a powerful supersonic exhaust jet. The reaction on the inside of the nozzle multiplies the thrust up and accelerates the vehicle. The various components named above have constraints on how they are put together to generate the most efficiency or performance. Important here is air intake design, overall size, number of compressor stages (sets of blades), fuel type, number of exhaust stages, metallurgy of components, amount of bypass air used, where the bypass air is introduced, and many other factors. For instance, let's consider design of the air intake. For aircraft travelling at supersonic speeds, a design complexity arises, since the air ingested by the engine must be below supersonic speed, otherwise the engine will "choke" and cease working. This subsonic air speed is achieved by passing the approaching air through a deliberately-generated shock wave (since one characteristic of a shock wave is that the air flowing through it is slowed). Therefore some means is needed to create a shockwave ahead of the intake. The earliest types of supersonic aircraft featured a central shock cone, called an inlet cone, which was used to form the shock wave. This type of shock cone is clearly seen on the English Electric Lightning and MiG-21 aircraft, for example. The same approach can be used for air intakes mounted at the side of the fuselage, where a half cone serves the same purpose with a semicircular air intake, as seen on the F-104 Starfighter and BAC TSR-2. A more sophisticated approach is to angle the intake so that one of its edges forms a leading blade. A shockwave will form at this blade, and the air ingested by the engine will be behind the shockwave and hence subsonic. The Century series of US jets featured a number of variations on this approach, usually with the leading blade at the outer vertical edge of the intake which was then angled back inwards towards the fuselage. Typical examples include the Republic F-105 Thunderchief and F-4 Phantom. Later this evolved so that the leading edge was at the top horizontal edge rather than the outer vertical edge, with a pronounced angle downwards and rearwards. This approach simplified the construction of the intakes and permitted the use of variable ramps to control the airflow into the engine. Most designs since the early 1960s now feature this style of intake, for example the F-14 Tomcat, Panavia Tornado and Concorde. In one unusual instance (the SR-71), a variable air intake design was used to convert the engine from a turbojet to a ramjet, in flight. To get good efficiency over a wide range of speeds the Pratt & Whitney J58 could move a conical spike fore and aft within the engine nacelle, to keep the supersonic shock wave just in front of the inlet. In this manner, the airflow behind the shock wave, and more importantly, through the engine, was kept subsonic at all times. Additionally, and unusually for this engine, at high mach, the compressor for the J58 was unable to carry the high air flow entering the inlet without stalling its blades, and so the engine directed the excess air through 6 bypass pipes straight to the afterburner. At high speeds the engine actually obtained 80% of its thrust, versus 20% through the turbines itself, in this way. Essentially this allowed the engine to operate as a ramjet, and actually improving specific impulse (fuel efficiency) by 10-15%. Finally, there is strong theoretical and experimental support for the idea that using a heat-exchanger to cool the air at the intake can increase the density of the air and thus reduce the necessary compression. This would create lower temperatures that permits lighter construction alloys to be used, reducing the engine's weight by several times. This leads to plausible designs like SABRE that might permit jet engined vehicles to be used to launch straight into space.